Sea Indpendent has announced that 37m expedition yacht Dr No has been given a $1 million price cut with the owner Tom Perkins reportedly very keen to sell and considering serious offers. Built in Japan in 1995, she was converted by HYS Yachts in 2010 into a luxury yacht capable of carrying a 6.9m Super Falcon submarine for underwater exploration. Accommodation is for eight guests in a master suite, VIP stateroom and a double and twin cabin. Dr No was featured in the September 2012 edition of Boat International and in the 2013 Refit book. Powered by a single Yanmar engine, Dr No cruises at 10 knots and is asking $3.9 million. 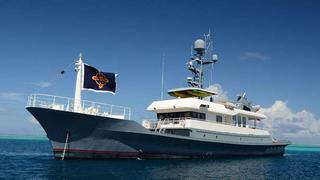 Dr No is jointly listed for sale with HYS and Sea Independent.